Last November, as worshipers were gathering for the “fajr” dawn prayer at 5 a.m. in Mubi, Nigeria, a man blew himself up inside the mosque, killing 58 people. He was 17 years old. Over the past eight years, the violent extremist group Boko Haram—whose name translates as “Western education is forbidden”—has carried out hundreds of deadly attacks on mosques, schools, markets and churches in northern Nigeria and frequently used children to carry out bombings. 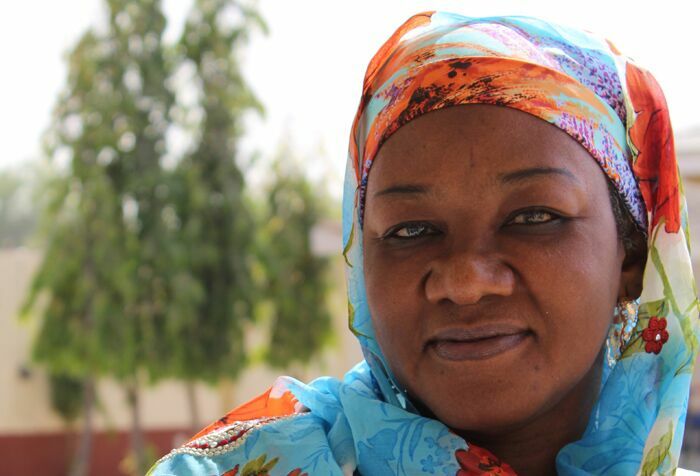 Women’s rights and peace activist Hamsatu Allamin, a member of the global Women’s Alliance for Security Leadership (WASL) and Federation of Muslim Women in Nigeria and the founder of Allamin Foundation for Peace and Development, decided to take action to change Boko Haram’s widely accepted rhetoric. Allamin was able to prove to her community that Boko is not forbidden, and that true Islam teaches that education is ‘Halal’ and it is the duty of every Muslim—man, woman and child. She spoke to ICAN’s Aya Nader about the links between education and extremism, her work so far and what comes next. What does extremism look like in Nigeria? It can be seen in so many different contexts in Nigeria. Apart from the violent extremism of Boko Haram and others that justify it through religion—Islam or Christianity —much of Africa and Nigeria in particular, is characterized by patrimonial politics and poor governance with institutionalized corruption that thrives on massive stealing from our defense and development budgets. The way they steal has gone beyond the normal to the extreme. Can’t we call this extremism too? The consequences of this kind of extremism is what is leading to violent extremism. Neglecting the society, forgetting about human resource development—and then youth become frustrated, whole communities and sectors of society become excluded and then they resort to violence in different ways. What made you decide to turn to peace activism? Being brought up in a very peaceful society, a society of renowned Islamic scholarship, violent extremism was completely alien to us. We have never witnessed mass violence. Gradually we found ourselves amid this Boko Haram insurgency, started by my known kinsmen, in my own community. It is terrible. If someone tells you they do not have a relative distant or close who joined Boko Haram, it is a lie. However: If a part of your body becomes infected, do you cut it and throw it away or do you treat it? On this basis I look at what happened to the boys in my society. Nobody else was doing anything, so I said, this is a period where someone has to engage with them. This mad circle of violence has to be stopped. I started my work. I think this is the period of giving back and seeing what we can do to make a difference. Where does the Boko Haram ideology come from? That very misperception is what became the ideology and then consequently violent extremism. What were the factors that led from exclusion from education to violent extremism? Is it about corruption of the state? Violence of the security forces? What is the connector? I can attribute every factor, including exclusion from education, to General Systems Failure. The structural driver at the center of all the vices in Nigeria is the patrimonial politics. It brings bad, poor governance with institutionalized corruption that thrives from massive stealing from our defense and development budgets. As a result, there is widespread abject poverty and illiteracy and exclusion and marginalization of the greater population of women, youth and people with special needs. Weakened and ineffective conflict management systems, mechanisms and architectures are exacerbated further by the large porous and unprotected international borders that facilitate the easy movement of people, drugs and light weapons, among others. Leaders of the large army of unemployed youths started agitating and voicing their grievances against the inequality and injustices in the society through an extremist ideology expressed in a narrative that “Boko”–Western/Secular education is “Haram”–forbidden. They advocated for a return to “Sharia,” the Islamic Legal and Social System as an alternative that offered justice, morality and freedom from corruption and condemned everything western as forbidden. Hence the name: Boko Haram. They recruited and subsequently empowered, strengthened and emboldened the aggrieved youth to impunity and violent extremism. With the escalation of the violence too, the government responded with creation of a Joint Task Force of all security agencies (JTF) led by the Military as an immediate response. Mismanagement of the situation by the military—because Boko Haram lives and operates within the communities, with gross human rights violations and abuses in the name of Counter Terrorism Operations—expanded the recruitment base of Boko Haram because several youth joined to take vengeance on the Nigerian Military. How does your work fight back extremism? I reached out to communities where Boko Haram were heavily recruiting. It was very dangerous but I had to go there and connect with the women. They were at first threatening me, but gradually they became cooperative and apologized for the lack of knowledge of my intentions. I started communicating with them. At the same time, I reached out to the government, especially the security forces who do not know who Boko Haram is. To them any youth in the society is Boko Haram because when they attack or kill, they run back to their communities and take refuge in their own houses. So in response, the government burns houses and arrests all without differentiation. The toll was too high. So I had to intervene through rehabilitating and reintegrating communities where they have heavily recruited. Why is reintegration important and how do you advocate for it? Contrary to the government’s perspective of reintegrating fighters and ex-combatants, we have to reintegrate them by introducing intra-community dialogue, by bringing men and women who are not communicating. Women were not viewed as important for issues affecting community, and we discovered that some of them found out that their kids were becoming members of Boko Haram and pushed them further—even helped them in holding guns. But they did not tell their husbands. We also organized other dialogues with schools to educate them about reintegrating the children in their system. We talk with the mothers and we empower them economically, too, to support the education of their children. Our approach is a holistic reintegration of the residents of the whole communities so they are rehabilitated. So, if you talk to them about bringing back their sons who had become perpetrators of violence, at least they have been healed of their traumas, and they can accept them without giving up their rights to justice. In addition, we focused on changing the counter narratives. It is a forgotten area; we have to change the narrative and then demystify this misperception that Western education is forbidden. Hence I turned to Islamic scholars and big Islamic organizations. It is not an easy task influencing Islamic scholars. How did you engage them? Boko Haram regards itself as an Islamic group, developed an ideology, and then it was operating and recruiting where there are Muslims, but they are ignorant of what their faith teaches. The greatest challenge to Islam is ignorant Muslims. Who is best to address this? Muslim scholars grounded in Islamic education. I reached out to them through the umbrella organizations like the Women Muslim Organization, and presented them with my idea. They were overwhelmingly happy, saying that this was the first time anybody ever called on them to discuss a solution with them. So we went back to the genesis of Boko Harem’s discourse, that western education is forbidden. I built on peace building concepts like education, women’s rights, human rights, living with non-Muslims, skills like negotiation, mediation and self-esteem. I asked them to do a research into what the Quran and Prophet Sayings (Hadith) say about these “western” concepts. They all had positive grounds in the Sharia, some of them even teach in educational institutions. Ultimately we want to show society that what they consider “western” is not only compatible but integral to Islamic discourse. The Koran calls for all to be educated. We put together a booklet which we named “The Manual of Peace Building in Islamic School.” We went to the radio with the book, because everybody listens to the radio. The scholars would go for weekly live phone-in programs where they would speak for half an hour then open the lines and people would call and ask questions or give contributions. We ran this program on two phases. What is the impact of the manual and call-in radio shows? The local authority confirmed to us that after the first 12 weeks there was a 40 percent increase in children’s enrollment in public schools, previously seen as forbidden to go to. Facilities became overstretched, so they would sit on bare floors and under the trees. We had to advocate for more infrastructure to accommodate the increasing numbers. The Radio program has been recommended by a blogger in the U.S. for adoption to the women of Afghanistan, while numerous requests have come up for its translations and use for the women Islamic classes too. What are the future plans for your peace work? The manual is been used in Islamic schools to teach peace. It is an extracurricular activity where teachers select students to attend sessions on a weekly basis. Then after completing the course, the students would recruit other kids and they will lead them through the manual. So before you know it, the community in the entire school would be enriched with this message of peace, coexistence, and tolerance. The idea is to catch them at an early stage. Furthermore, the Islamic schools in my area have adopted this book and made it compulsory for children to study. It has now been translated into Arabic and two local languages with support from ICAN, so the content can be used in the women and adult weekly Islamic lessons as well. I am now planning and seeking for more support to scale up these interventions in more communities across the entirety of Northern Nigeria, and also support me intervening with victims of early marriage and early divorce and facilitate institutional and societal changes in this regard. Safety is at jeopardy when combating terrorism. Have you faced any risks? I became the victim when I was arrested by the government’s counter-terrorism operations during a discussion with people seeking solutions. The military arrested us. Nobody could bail us out until we were able to convince them to let us out. My son was almost killed by these counter-terrorism operations too. So while terrorism is taking its toll, counter-terrorism mechanisms are also taking their toll on us. No journalist or writer would go to our part of the country. So it is left to us. Where does the Women’s Alliance for Security Leadership (WASL) come in? WASL is extremely important. I am privileged to be one of the first pioneer members and part of the first meeting that gave birth to WASL then following through to realize all its ideas. It has helped us tremendously in cross-learning among members across the world, where we come together, share our experiences and merge them with whatever we have and do what we do better, and resources in some of the interventions we are doing. For example, partners from other countries now want to adopt the manual we developed and use it to benefit their own youth. WASL has widened our connections, and provided us with a sense of security as human rights defenders, as peace makers, as people countering violent extremism and engaging with a wide range of stakeholders. To be internationally connected is greater security itself, and we are growing bigger. How does ICAN help your work? ICAN has built my capacity further and provided me with the resources to challenge the extremist narrative of “Boko Haram” to “Boko Halal.” I developed the idea, identified some Western Peace Building concepts… and engaged with Islamic scholars, both men and women (for the first time ever, they confessed! ), through the two most powerful umbrella organizations of Muslim Associations in Nigeria—the Jam’atu Nasril Islam and the Federation of Muslim Women in Nigeria in Borno state—to come up with what the Holy Qur’an and Hadith said about the concepts. We then published this into a Modular Manual of Teaching Peace and Peaceful Coexistence in Islamic School, not embedded in the curriculum, but as an extracurricular activity of running Peace Clubs in the schools. ICAN’s support also enabled me to design a Life Radio Phone-in Program using the content of the Manual, where Islamic scholars weekly speak on one of the topics, and then open the line to the public for contribution and questions. After the first 15 weeks of running the program, authorities confirmed 40 percent increase of enrollment of children, more particularly girls, into the public primary schools. Facilities in existing schools became over stretched, that children had to sit under trees and on bare floors for lessons. With these two initiatives, we change the society’s negative misperception and apathy to the West and Secular Education by clearly demonstrating that what the society hitherto misconceive as forbidden are indeed not only compatible, but in consonance with the Islamic Principles, and hence transformed Boko Haram to Boko Halal. ICAN has also supported me as I develop and implement my own model of Social Norms Realignment and Reintegration in a community where Boko Haram has heavily recruited through intra- and inter-community dialogues, dialogue with service providers including security agencies, economically empowered widows with skills and start grants and enrolled orphans into the community schools. Finally, through ICAN and its numerous gatherings, I have widened my network and horizon as I come across some amazing women operating in different contexts. We are able to share experiences and learn more from each other, hence we inspire one another to do even more in our own contexts.